Soldiers' Angels - Thanks Clorox VetNet! Employees from two different locations collected socks for the Soldiers’ Angels Warm Feet for Warriors sock drive. 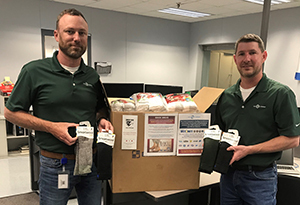 Their Arkansas location collected 410 pairs and their Atlanta location collected 593 pairs—a total of 1,003 pairs of socks that will be handed out to veteran patients in VA hospitals across the country and shipped to deployed service members around the world!